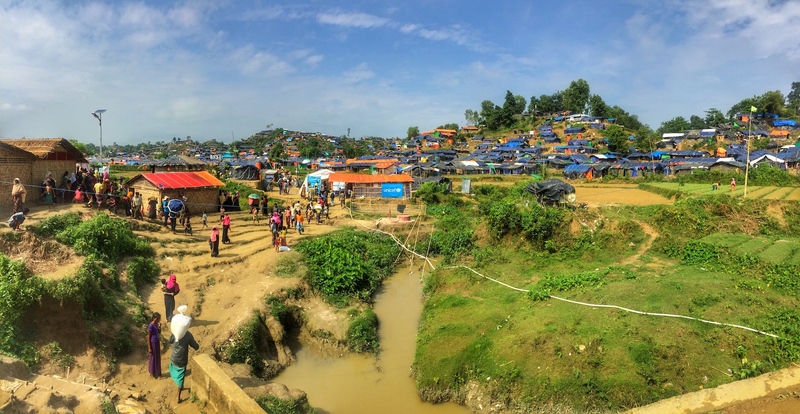 More than 600,000 people have crossed the Myanmar border since late August and are now joining the initial 200,000 or so who fled from earlier outbreaks of violence. I have been assigned to work as a WATSAN focusing on drilling water boreholes and constructing water distribution systems to reach Rohingya inhabiting the high hilltop areas in three makeshift settlements (camps); Unchiprang, Jamtoli and Hakimpara. Unchiprang´s makeshift settlement is situated 10km south from the other two settlements and has a population of about 30,000. The settlement is confined by farmland, yielding crops and a single dirt road. Tents are constructed close together or in most cases even adjoining. All aid organizations are set up along the main dirt road. It is constantly scattered with sweaty people trying to reach the markets, the military food distribution, World Health Program food distribution and water distribution points, as well as health clinics from various NGOs including MSF. The people that live close to the road have easy access to clean drinking water, however for the people who live beyond the hilltops access to water is limited. Based on several geological and hydrological reports on this area, and meetings with the local experts, it is not feasible to drill deep wells because of very hard rock or clay within a thick clay formation above the water aquifer. Both did express lucrative potential of the large amount of surface water that could be harnessed and made potable. To take advantage of the surface water and top aquifer layer we are constructing a dam, some water collection ponds and thirty hand-dug shallow wells. Currently in Unchiprang MSF has constructed 4 hand-dug wells, each four-diameter across and thirty feet deep. Each well can provide enough water to 500 people per day. To ramp up construction and ensure that there will be enough water in remote areas of the settlement during the dry season (November to January), I hired and coordinated six construction teams to dig 6 wells simultaneously. The goal is to have at least 20 wells completed by the end of November and 30 by the end of December to meet the settlement’s water demand. The well construction teams are a mixture of Bengali and Rohingya, and take about 1 week to complete. Concrete rings are carried by hand to the well locations and lowered in with a bamboo structure with a pulley system. Cars and ATVs are not able to drive into the settlement because the pathways are very narrow.